Dan is an attorney practicing primarily in the areas of patent prosecution, patent litigation, and intellectual property counseling. He has experience in many technology areas ranging from the chemical arts, including inkjet printing systems, industrial chemical processing and confectionery products, to the mechanical arts, including medical devices, seating technology, automotive technology, and turbo fan engines. In addition to his litigation experience in Federal Court, Dan has experience representing and counseling clients in post grant matters such as inter partes review (IPR) proceedings before the Patent trial and Appeal Board (PTAB). Dan received a B.S. in Chemical Engineering and a B.S. in Biological Sciences from the Missouri University of Science and Technology. 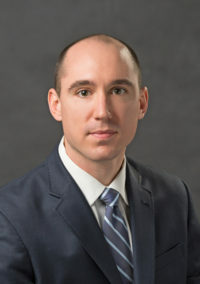 After completing his undergraduate work, Dan worked as a chemical engineer at Archer Daniels Midland Company where he managed various refinery processes. Dan studied law at Chicago-Kent College of Law. While pursuing his legal education, Dan was a fellow with the Chicago Intellectual Property Colloquium, an Executive Articles Editor for the Chicago Kent Journal of Intellectual Property and held various positions with the Intellectual Property Law Society. During law school, Dan worked as a patent agent at a patent boutique firm in Chicago. During his third year of law school, Dan worked as a judicial extern for The Honorable Amy St. Eve in the U.S. District Court for the Northern District of Illinois. Prior to joining McCracken & Gillen, Dan worked as an attorney at a patent boutique where he specialized in patent prosecution.